In 1893 Doyle took his wife Louisa and two young children to Davos, in Switzerland, in the hope of finding a high-altitude cure for Louisa’s tuberculosis. While there, he wrote about his experience of a new pastime, skiing. The sport was almost unheard of in Britain at the time, and the Sherlock Holmes writer’s articles did much to popularise both it and the Alps. Born in Edinburgh in 1859, Sir Arthur Ignatius Doyle (he added the ‘Conan’ later on) might be best known today for his hugely popular stories about the ingenious pipesmoking detective, but there was much more to him than that: as well as being a qualified physician, he was a political campaigner, had a fascination with spiritualism and the occult (including a steadfast belief in the existence of fairies) and was also a prolific sportsman. While all of these qualities are well documented, much less is known about Conan Doyle’s services to skiing. In 1893 he wrote an article for the Strand (the magazine which also serialised his Sherlock Holmes stories) entitled ‘An Alpine Pass on “Ski”’. Today, some 110 million people ski in more than 80 countries around the world and the Alps are the biggest ski destination in the world, accounting for 45 per cent of all ski visits. 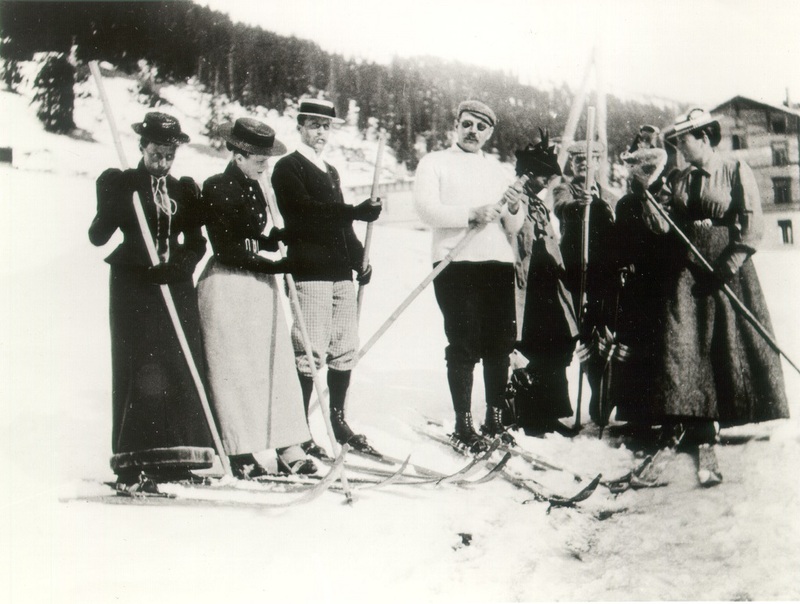 For the vast majority of the Strand’s readers in the 1890s, however, Conan Doyle’s article was the first time they would ever have heard of skiing. The fact that he needed to describe skis shows just how new the sport would have been to his readers: ‘There is nothing particularly malignant in the appearance of a pair of “ski”,’ he wrote. This is not to say that skiing was anything new in 1893. Cave paintings found in northern Norway and dating from four thousand years ago depict a man on skis, and the remains of skis have been found preserved in bogs in other parts of Scandinavia – the oldest being one discovered in Sweden that is around four and a half thousand years old. The Norwegian military held skiing competitions from at least the 1670s, and the first known civilian ski race took place in Norway in 1843. The invention of skiing in its modern form has been accredited to Sondre Norheim (although there is some debate about this), from Telemark in Norway, who developed the equipment and techniques that led to skiing as we know it today. It was in the 1870s that he developed the short, curved, flexible ski that allowed for easy turning in soft snow. It was on a visit to Norway a few years before his trip to the Alps that Sir Arthur Conan Doyle had first encountered skiing. Although he only observed the sport he had always harboured a desire to have a go, so when he arrived in Switzerland and realised the geography and climate was similar, he ordered a set of skis to be sent to him from Norway. Of course, Conan Doyle was undoubtedly playing up his incompetence for comic effect, because in reality he was a very accomplished sportsman. He told the editor of the Times that he had ‘sampled most British sports’ and, in his memoirs, he described himself as an ‘all-rounder’ but ‘second-rater’; which was somewhat overly modest for a man who was goalkeeper for Portsmouth Association Football Club, played ten first-class matches for the MCC and was captain of the Crowborough Beacon Golf Club. It did not take Conan Doyle long to master the basics of skiing, after which he found a couple of local skiers, the Branger brothers, and together they put their skis to the test. Without the aid of a ski lift, they made long and often treacherous journeys into the mountains, including the 7,700ft Jacobshorn, and a trip to Arosa – which in winter could normally only be reached by train – across an extremely dangerous pass almost 9,000ft above sea level. Crowds of curious, amused locals turned out to watch Conan Doyle and the Brangers. Indeed the Swiss pair had been skiing for well over a year but had taken to practising at night to avoid the ridicule. The irony, of course, is that Davos is now one of Switzerland’s most exclusive ski resorts. And there is no doubt that Conan Doyle helped in this development. His article on skiing, lit with self-deprecating humour, was hugely entertaining. However, his reason for being in Switzerland in the first place was a lot more serious. His wife, Louisa, had been diagnosed with TB and it was suggested that living at a high altitude would benefit her health. They lived in Davos for four years before returning to England. Louisa eventually died in 1906, her husband maintaining that it was the mountain air that had kept her alive for much longer than expected. 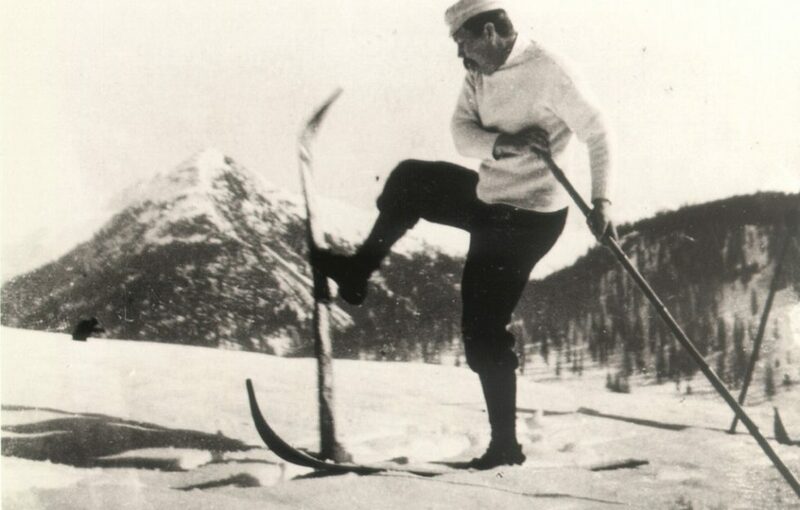 So, rather unwittingly and in somewhat sombre circumstances, Sir Arthur Conan Doyle – Britain’s first ski journalist – helped both to introduce skiing to Switzerland and popularise the sport in Britain. Indeed, his interest in spiritualism and the occult may also have extended to prophecy and second sight, because he certainly saw into the future when he wrote: ‘I am convinced that the time will come when hundreds of Englishmen will come to Switzerland for the “ski”-ing season’.